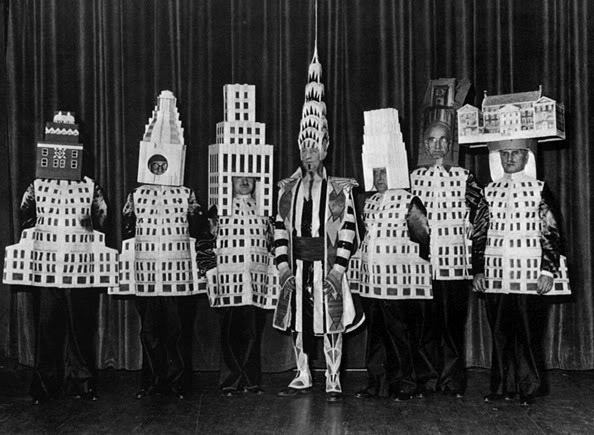 From left to right, A. Stewart Walker as the Fuller Building, Leonard Schultze as the Waldorf-Astoria, Ely Jacques Kahn as the Squibb Building, William Van Alen as the Chrysler Building, Ralph Walker as the Irving Trust, D. E. Ward as the Metropolitan Tower and Joseph Freedlander as the Museum of the City of New York. The beginning is always difficult [at least for me]. I get intimidate by all the emptiness, all the white of paper, a canvas, a post background. So I came across this photo from 1931, which expresses literally how architecture can become wearable. The following posts will speak for themselves. It will be about concepts, about the process of creation, about art and design, about music and movies, but above all, about fashion...through the eyes of an architect.